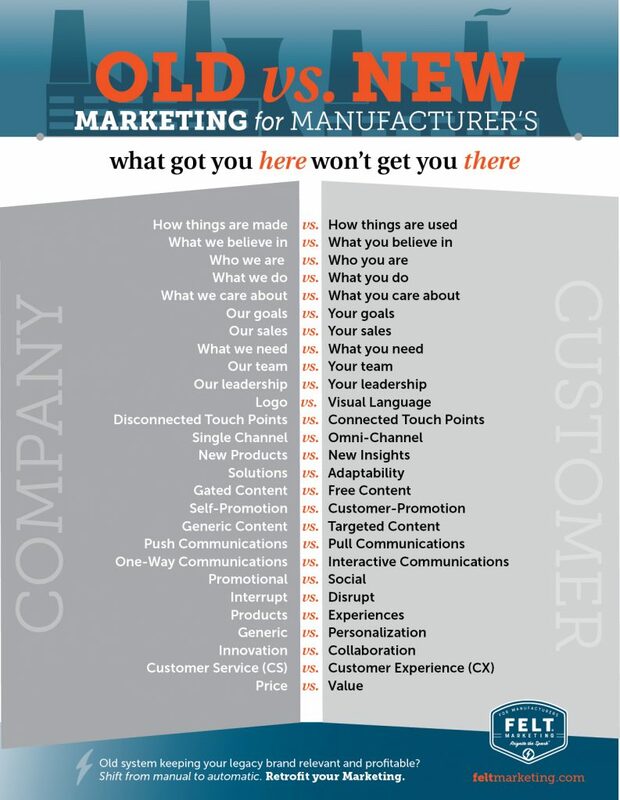 “There are two kinds of marketing [for manufacturers]. There’s the kind that no one can possibly like. The popups, popunders, high-pressure, track-your-private-data, scammy, spammy, interruptive, overpriced, overhyped, under-designed selfish nonsense that some people engage in. And then there’s the kind that inspires us, delights us and brings us something we truly want. Marketers are basically bloodsucking vampires, who charge a hefty sum to do their creative voodoo, that may or may not produce a return on my investment. I don’t completely understand or trust marketing. 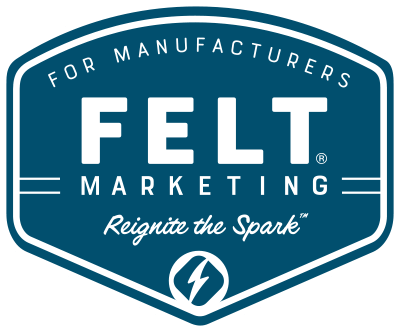 For the skeptics, marketing still feels like something they HAVE to do versus something they WANT to engage in with the customer, for the customer. Because, after all, marketing is still like what they did on Mad Men. Right?! On a very basic level, the two kinds of marketing can be broken down into old and new. Old marketing was about the company, for the company. New marketing is emotionally engaging and made for the customer. Teaching an old dog the value of new marketing, however, is proving to be about as easy as herding cats. Every leader I talk with is getting pushback from upstairs. Odd, considering these same skeptical senior leaders are completely intrigued by technology. Old beliefs and habits die hard. Old marketing focused on selling over solving. Impressing over understanding. Talking at instead of listening to. And, throwing money at instead of investing resources in. Sound familiar? Trips and dinners and golf tournaments and more shirts, hats, and jackets than any customer could wear in a month. In-house teams are given a green light to hire new talent, splurge on a slew of full-page print ads and create a new trade show display with flash and panache. All tangible, but costly, and difficult to measure. And, what a perfect time to resurrect our social media efforts from the dead and talk about our quality products, exceptional customer service, featured employee of the month, trade show schedule, and recent awards we received. Inevitably, the economy slows down again, sales plateau, and most of that “marketing” will come to a screeching halt. Marketing dollars are the first to be diverted elsewhere. Nice to have, but not necessary. Then, it’s up to the sales team to go out there and just sell harder! Not exactly a proven strategy or system that supports sustainable growth for manufacturers. Conversely, the next generation wholeheartedly believes in and understands the power of the other kind of marketing—that’s consistent, intentional and exchanges value for attention and loyalty. Why current customers choose them. Where they go to find out what’s new. How they like to communicate. What obstacles stand in the way of growing their businesses. Tapping the sales team (their “boots on the ground”) is non-negotiable. They are a key asset in understanding the most common customer struggles and greatest success stories. And, then diving deeper. Surveying the industry landscape. Examining trends, and considering untapped markets and opportunities. Armed with this newfound understanding they embark on a journey with prospects and for customers. And, per the sage advice of Seth Godin, arm their brand to show up and show up and show up, to be of great service and problem solve rather than sell. The showing up goes well beyond the sale. It happens consistently before and after the sale through culture, intention, marketing and nurturing. Margaret Magnarelli said it brilliantly, “New marketing is content-centric, customer-focused, cross-channel and most important, caring.” Going to great lengths to understand customers challenges, preferences and personalities. And, then engaging with them thoughtfully and consistently before, during and after the sale. After all, “the aim of marketing is to know and understand the customer so well, the product or service fits him and sells itself.” (Peter Drucker) As a result, emotionally engaged customers are 33% less price sensitive, 44% less likely to shop around and 300% more likely to become a repeat customer. Who doesn’t want that?! The difference between old and new marketing isn’t about gargantuan budgets or outrageous ideas. The difference is in the intention, engaging with empathy, and consistency at every touch point — a connected marketing system made for the customer, not the company. Ask yourself this, “Is what you’re spending getting you the results you want?” Marketing with heart, for the life of the customer or mostly when it’s convenient and the economy is booming? You know that what got you here won’t get you there. 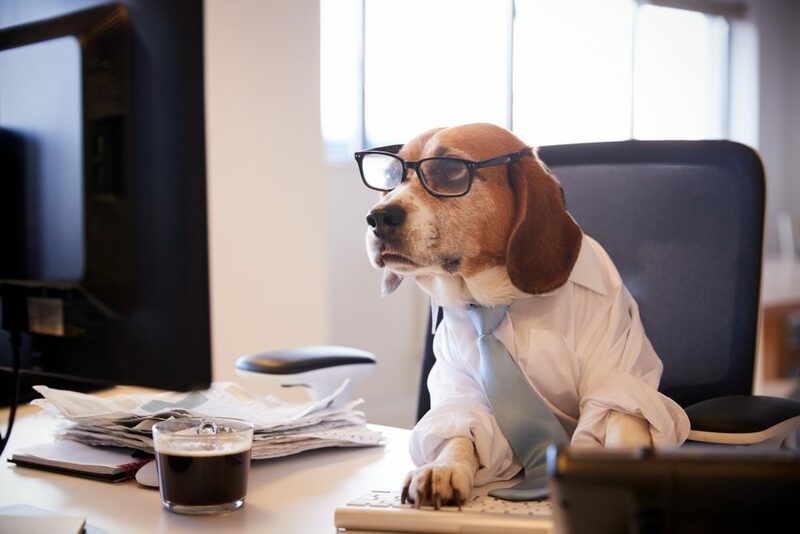 Old dogs can embrace new marketing. They just need to be reassured this is a voodoo-free zone — there are no Mad Men here.